How will Fortnite’s v7.40 balance adjustments affect the game? We break down why nerfs to the Hand Cannon, the Rocket Launcher, and Storming Planes matter. Fortnite’s v7.40 update has been postponed to Wednesday. Players will only have access to the update’s full patch notes early tomorrow. But developer Epic Games revealed yesterday a few balance adjustments that are coming with that update. They include important changes to items that several Fortnite streamers and the community have been complaining about for the past week, and now Epic is catering to them all to some extent. After numerical adjustments to Rocket Launcher, Hand Cannon, and Stormwing, what really matters to players is how these numbers will affect gameplay. We break down for you how each of the v7.40 balance adjustments can impact Fortnite’s current meta and how useful some items will be from now on. Rocket Launchers will be hit hard by the balance adjustments. Their reload time will be increased by 28 percent (from 2.52s to 3.24s) and they’ll no longer be found in chests, only in Vending Machines and Supply Drops. That means Rocket Launchers will be more difficult to find and spam. Players will be vulnerable for longer when reloading them, which means it might be harder to launch several shots in a row without getting tagged by an opponent. This might make Supply Drops be contested more often by opponents since they’ll likely carry a Rocket Launcher. But the weapon won’t be as reliable as it has been. The Hand Cannon has been a dominant weapon for destroying enemies’ structures in a single shot. It’s often used after shooting a rocket towards a wall an enemy is using as a cover. If you time it correctly, you can take down that wall to make the rocket fly past it before the opponent builds another one. And that’s why the Hand Cannon’s damage to structures will be reduced from 150 to 100. 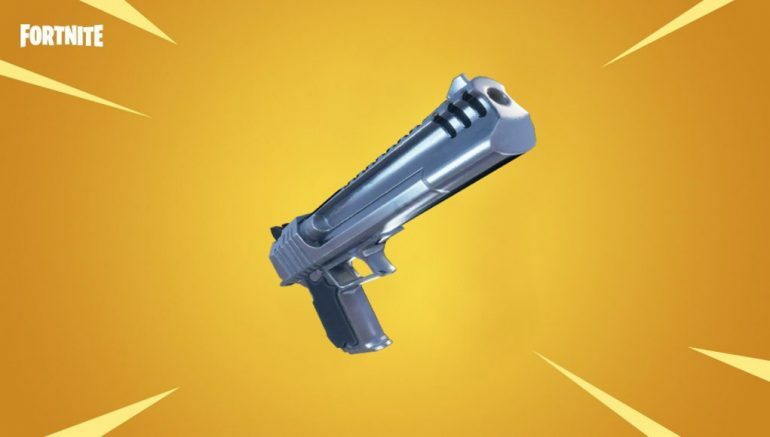 That’s a very significant change, as the Hand Cannon will no longer be able to destroy metal walls in a single shot as soon as they are placed since they have 110 starting health. Also, it won’t destroy wood walls in a single shot even after they reach their max 150 health. That means the Hand Cannon and Rocket combo will be harder to pull off, which might make the Hand Cannon a lot less mandatory against turtling enemies than it is now. The X-4 Stormwing plane is more than a vehicle. It has a mounted turret and can demolish structures when you boost through them. Well, not anymore. Planes will no longer smash structures under any circunstance. Trying to do so will only deal damage to your plane. This means players will be able to defend themselves from incoming planes by just building a wall if the opponent isn’t shooting. It’s a very annoying feature of X-4 Stormwings that will soon be gone, but it doesn’t mean planes will be dead. They’re still the fastest vehicle in Fortnite, and players can use them to surprise opponents by hopping off and gliding into a fight out of nowhere. After v7.40, it might still be worth it to use Stormwing Planes, but they will be less threatening to opponent’s structures. These changes all add up to a build-oriented meta, since the main methods of destroying buildings will be weaker. As long as you build structures and pay attention to their health, you should be safe from item combos or from a huge metal machine bursting through your defenses while knocking you back. The v7.40 update will arrive tomorrow morning.